I-Play’s Pigeon Squadron for the iPhone and iPod Touch puts you into the talons of a military pigeon, Philby, on a mission to poop on humans, cars, cats and dogs in cities across the world. If you watched the Superbowl a few years back, you may remember a car commercial with a similar premise. In Pigeon Squadron, you see each city from above and virtually everything is a target. The game lets you use the iPhone’s accelerometer to steer your pigeon avatar, and with a button on the left side of your screen, which looks like a bomb, you can drop on a target. Unfortunately, there isn’t much more to the game than “bomb” and fly. You go about your pigeon-dropping rampage in three global cities. The three cities you play in are called Cockney, Gauille and Metro City—London, France and New York City substitutes. In each city, people walk the streets, cars drive down roads, people sunbathe in parks, ducks swim in ponds, and other animals roam the sidewalks—they are all targets. Each city has different missions (about seventeen for each) for you to complete before you can go on to another city. At the beginning of each mission, a pigeon, known as the “General,” will brief you on what you have to do. In some missions, all you have to you to do is poop on every being in site, while in some you have to only poop on select targets. 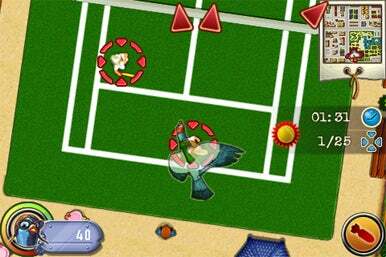 In one mission, it is requested that you only “bomb” tennis players. Still, when you get down to it, it’s all about dropping on targets. If you succeed at “bombing” a target, you get points. At the end of each mission (missions last about two minutes), your points will be counted and, if you get enough, you might receive a bronze, silver or gold medal which will unlock the next level. In theory, all you have to do to “bomb” a target is to fly over it. I found this not to be the case. It’s hard to keep your pigeon over a target, as a slight twitch of your wrist will move your pigeon. It is not impossible to target, but it is one of the game’s more challenging aspects. While flying, I highly appreciated that the game allows you to take music from your iTunes collection and make it your personal soundtrack. There are more games than I like to mention that don’t allow such an option. Otherwise, I heard everything in Pigeon Squadron clearly, and was admittedly, very pleased hearing the crys of my pigeon dropping victims. Visually, the game has fine animations and vibrant colors. It’s not in 3D, but that isn’t a problem. As an aside, I was amazed at how many animations there are of people with hats in the game. This isn’t the 1950’s. I've never seen an urban center with so many hat wearers. Maybe these cartoonish people are used to militant pigeons. Though there are different missions you have to complete, essentially the game is a target-and-shoot game. Pigeon Squadron is amusing for a few minutes due to its unique concept and crass humor, but when you get down to it there isn't much depth here.